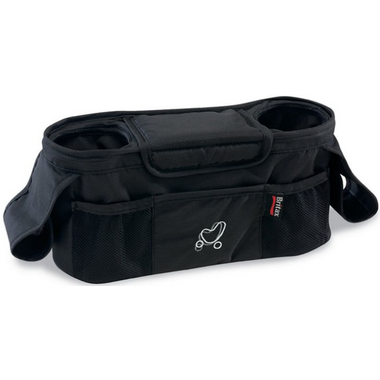 The Britax Stroller Organizer provides convenient storage for all your essentials while on a stroll. The organizer easily and securely attaches on almost any stroller handle and is adjustable to the stroller handle angle and width. Features two insulated beverage holders keep cold drinks cold and warm drinks warm. An internal frame provides structure and creates effortless removal and replacement of bottles or cups. The large center compartment features a magnetic closure that won’t wake your sleeping baby when opened. Contains three outside pockets are easily accessible for small items like cell phones or keys. The collapsible design does not interfere with the stroller fold and an adjustable mounting system fits all Britax Strollers and most other manaufacturers strollers.